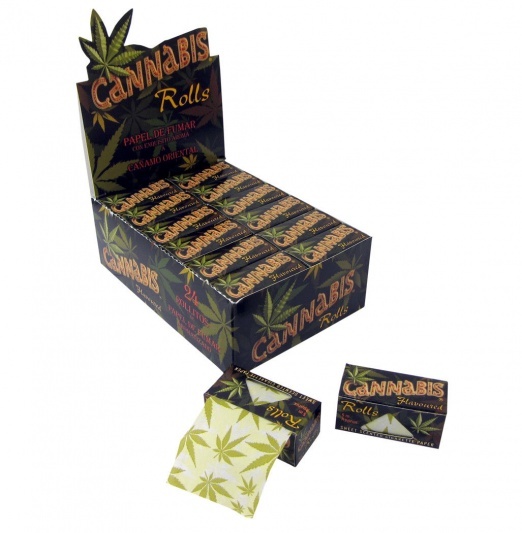 Cannabis Flavoured Rolls Rolling Paper have a sweet scented taste of the flavour of cannabis. Each pack of cannabis rolls have been sealed to ensure the freshness is sealed in. The roll of paper has the cannabis leaf emblazed over the paper as well as being made from organic hemp. There are hundreds of different kinds of rolling papers on the market. This can be confusing to the novice. Even long time smokers may use a paper because it is available at the local store. The information presented on this page can help you make an informed decision on choosing the rolling paper that is right for you. What confuses most people are the terms width and length of a rolling paper. The width of a rolling paper is based on the distance from the bottom of the paper to the top. This is where the glue line is at the top, as it is when being rolled. There are no standard sizes for width or length and it varies from paper to paper. It will even vary amongst the same brand. This is why we have a table indicating sizes of the paper. Please look at these tables carefully as they will help you to make a decision. The most common different widths are single wide, 1 1/4 wide, 1 1/2 wide, double wide and king size. 1 1/4 papers are the most common size overall. Although, in the end it comes down to personal preference. The length of most single wide rolling papers is between 2 3/4 inches to 3 inches long. Some manufacturers make longer papers usually designated as king size or extra long. There is no standard, so a king size rolling paper produced by one company will probably be a different length than a king size paper made by another company. Usually referred to in such terms as free burning (thick size rolling paper), medium weight, lightweight (fine size rolling paper), extra thin (extra fine size rolling paper). Thinner paper allows more air passage through the paper when you inhale, which makes the cigarette burn slower than a thick paper would. Thick rolling papers are the easiest to learn to roll with. Thicker rolling papers are usually referred to as free burning rather than quick burning, unless it's extinguished they will just keep burning. A thin rolling paper will usually go out within a few seconds if placed in an ashtray. A thin paper (fine or extra fine) is usually recommended when rolling tobacco or herbs but a quick burning rolling paper comes in handy when smoking tobacco or herbs that are a little damp. Smoking Supplies thanks Davis Peter who is the author that wrote the article at sooperarticles.com regarding the breakdown of these sizes. When you study this chart it makes it easier to understand the confusion. The width designations by the rolling paper industry such as single wide, 1 1/4, 1 1/2 and kingsize refer to the length of the paper. The rolling paper industry measures the width of the paper by the glue lines. We must mention again, these sizes do vary greatly from paper to paper.